Integrate 3D Chrome Spheres as design elements for your PowerPoint presentations. Let your creativity run wild with our templates set which provides the necessary design elements. 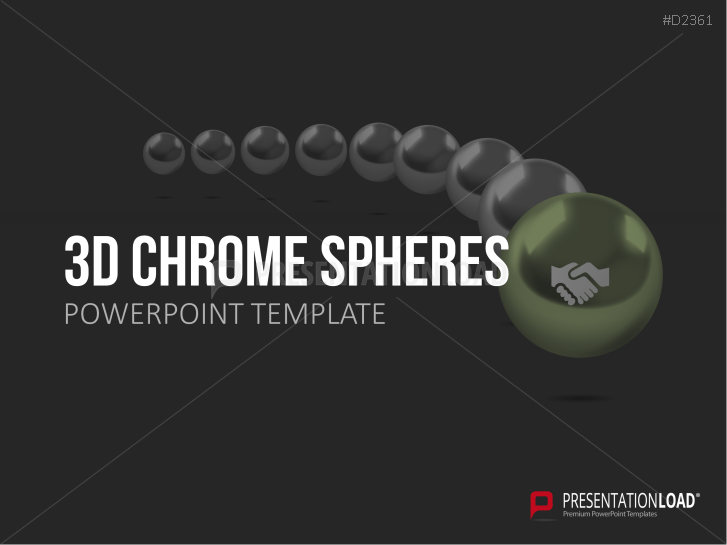 Our graphics of chrome spheres offer a variety of design elements for your PowerPoint slides. They can be arranged as desired to new structures, shaped as arrows or circular radial diagrams, or represent a spherical pendulum that catches the eye. For example, spheres ascending in size that are arranged in a row can represent a procedure in several intermediate steps. Detached, contrasting spheres illustrate individual thoughts and ideas. These along with other similar symbolic representations can be conveyed with our sphere graphics in chrome design. Our PowerPoint package offers a selection of different design templates, which can be used not only as finished slides, but also as design ideas. One of these ideas is a semicircular ramp, where one chrome sphere seemingly rolls down on more spheres. A toolbox with different colored sphere elements provides further options to customize and extend.